Is there anything BETTER than a fresh-from-the-oven blueberry muffin? I say no. 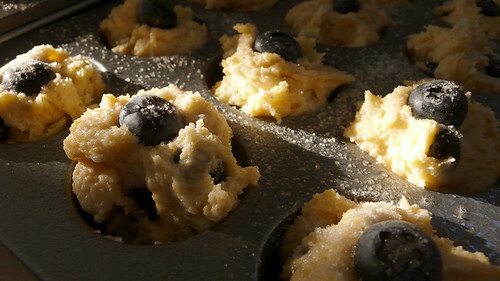 Anytime I’m feeling SLIGHTLY under the weather and want to feel better: Blueberry Muffins. 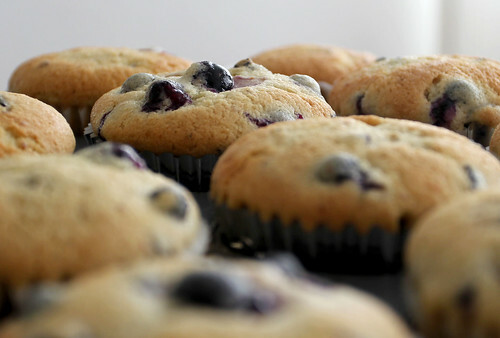 If I’m already feeling pretty fantastic, and want to feel fantastic(er): BLUEBERRY MUFFINS! There are two recipes I turn to when I start to get that craving… One is a traditional, almost cake-like muffin, and one is a heartier cornmeal blueberry muffin. I’ll share both recipes with you here, because I like you so much. Grease twelve 2 1/2-inch muffin cups or line with paper and set aside. In a medium bowl combine flour, sugar, baking powder and salt. Make a well in the center of the flour mixture and set aside. In another bowl, combine egg, milk and oil. Add egg mixture all at once to flour mixture. Stir together. Fold in 3/4 – 1 1/2 cups fresh blueberries (I prefer more berries in my muffins and usually double the recommended amount), and lemon zest. 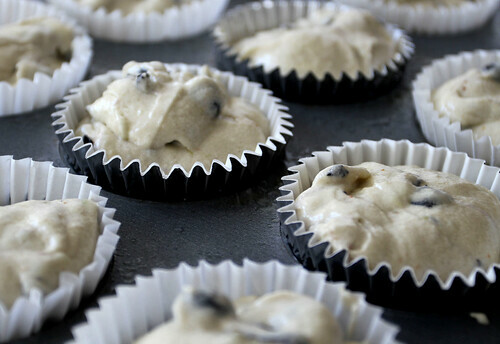 Spoon batter into prepared muffin cups, filling each two-thirds full. Bake at 400 degrees for 18-20 minutes or until a wooden toothpick can be inserted in the center of the muffin, and pulled out clean. Cool muffins on a wire rack for five minutes before serving. Directions Heat oven to 375 degrees. Place a Silpat (French nonstick baking mat) or parchment paper on a baking sheet; place six 2 3/4-by-2-inch pastry rings on it. Cut parchment paper into six 10-by-3-inch strips; use them to line molds (paper will extend above rims). Place softened butter, 3/4 cup sugar, and honey in bowl of an electric mixer fitted with the paddle attachment. Beat on medium speed until fluffy, about 1 minute. Add eggs; beat 1 minute more. Whisk flour, cornmeal, and baking powder together in a medium bowl; add to butter mixture in mixer bowl. Beat until combined. Slowly pour in milk, beating on low, until just combined. Fold in blueberries. Divide dough among molds (do not pack too firmly; each will take about 1 cup). Brush tops with cold water; sprinkle 1 teaspoon sugar over each. Bake until tops are browned, centers are set, and a cake tester inserted in center of muffin comes out clean, about 30 minutes. Let cool in pans 5 minutes. Tie kitchen twine around muffins to hold parchment. Serve at once. Both of these recipes are regulars in my kitchen! I bake them for friends and neighbors, for MYSELF, and almost every time we go camping I’ll bake these the night before, so that we can have a yummy breakfast-on-the-go. 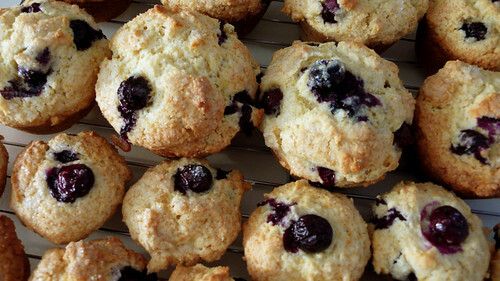 If you need a good blueberry muffin recipe, I encourage you to try these. And then invite me over to eat them with you! Thanks for reading & happy eating!! Making English Muffins and Announcing the Contest Winner!! Last-Minute Edible Gifts: A Round-Up Vegan Pumpkin Muffins That Don’t TASTE Vegan Baking Yeasted Meringue Coffee Cakes Birthday Lemon Cake with Fresh Lemon Curd Homemade Bagels: The Taste of Redemption! oh martha, just use a freaking muffin tin already! I know right? You can see from my photos, I did too! Her recipe LOOKS pretty in those paper things tho… I’m just lazy I guess! 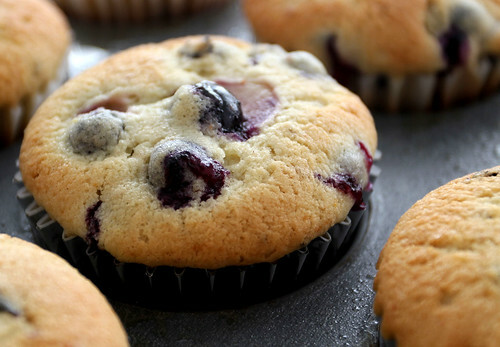 Have you tried the allrecipes Blueberry Muffins To Die For? Those are my favorite! They have a crumb topping, too. YUM! I think the first set of muffins look more traditional, but both look tempting! Those look yummy. 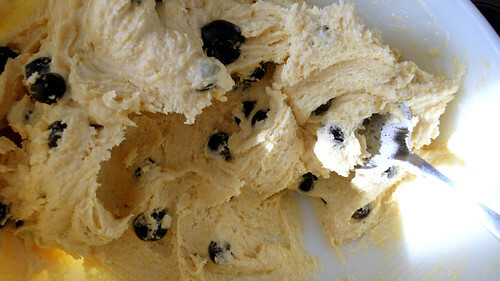 Must buy blueberries and make them now! The best ever? That’s a bold claim. (tastespotting) I’ll try it because despite my love of blueberries, I haven’t yet found the ultimate muffin recipe. Great Pics. Thanks! Patricia – we have three blueberry bushes at home that are soooo full of flowers. I hover over them daily, waiting for the day I can HARVEST!! Thank you thank you thank you!!!! I’m going to make these ASAP! I just found this post and it was great! We’re on vacation and my BHG cookbook is at home. 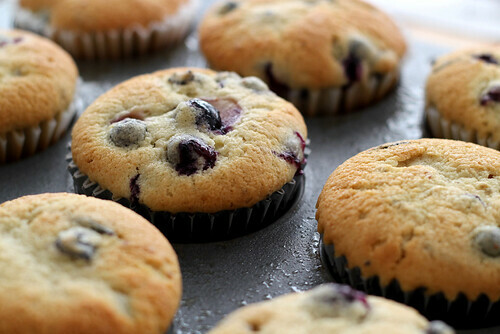 I searched for their blueberry muffins recipe and found your site, and this has saved tomorrow’s breakfast! Thank you!! !